The Baccalaureate Theater Company’s production of Shakespeare’s Macbeth will debut in June after months of rehearsals and preparations. Director Olivia Witting ’14 will stay true to the original script of the centuries-old tragedy, but has made use of modern costumes to create a new age version of Shakespeare’s work. Witting and her father, Steve, who has been helping his daughter with her directorial responsibilities, chose this specific play for the Theater Company to perform. They got in touch with 12th grade English teacher Mr. Potter last summer and asked which plays he had chosen to teach during this academic year. Olivia said, “Since we were studying Macbeth in class, I thought the actors could get insights into their characters.” The majority of the cast is made up of 12th grade students and thus the actors have studied the tragedy in-depth. They have also had the chance to write about it during the IB English Exam last month. Costumes are being rented for $45 a piece from the Kaufman Astoria Studios’ Costume Collection. Wood also had to be purchased in order to construct the set. As a result, the Company needs to offset costs with ticket sales. The price range for regular seats is $3 to $5, with the cheaper seats being further from the stage. For 7th and 8th graders, $2 seats are available in front, but they are small stools. 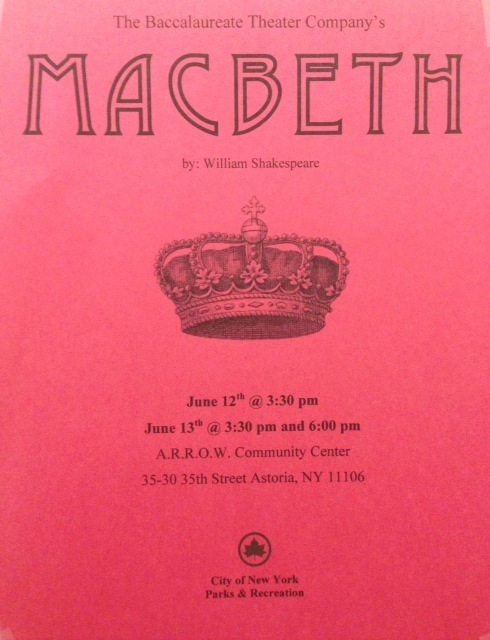 There will be three showings of Macbeth at A.R.R.O.W., which is located at 35-30 35th St. Astoria, NY. Opening day is June 12 at 3:30. On June 13, there will be one performance at 3:30 and a second at 6:00. Tickets are currently on sale.